A Former Love Islander ‘contestant’ has made claims suggesting the popular ITV2 show is staged. Well, it’s not actually that shocking, surely? The claims come from last series’ contestant Tyla Carr, who says producers dictate what conversations are had on the show. What viewers don’t see is there is always a producer on site. They don’t live in the villa with us but someone generally comes in every hour to have a chat. They would often tannoy an announcement asking for someone to come to the sofa to have a chat with one of the producers. They tell you what they want you to talk about, and who with. Tyla also said the contestants are told they ‘must tell producers’ if they’re going to be having an important chat with someone else. That way they can ensure the microphones are there to ‘pick up the confrontation’. Apparently if they forget to inform the crew of their ‘important conversations’, stars are forced to film the conversation again. Liv Attwood had to dump Sam Gowland twice last year, which was embarrassing for both of them. Love Island spokespeople have denied the claims. It is absolutely untrue to suggest Love Island is fake. The opinions they have and the relationships formed are completely within the control of the Islanders themselves. As we have said since series one, Love Island is a combination of reality and produced elements. Any produced elements are designed to allow viewers to understand what the Islanders are feeling and to help move narrative threads on. Tonight’s (July 1) episode is set to bring some drama for Georgia Steel, whose Love Island partner Josh Denzel looks set to get with Kazimir Crossley. In an ITV2 preview clip at the end of Friday’s (June 29) episode, Josh was seen kissing Kaz as they shared a bed together in the villa. Georgia had made the decision to stay away from the new contestants and slept outside on a day bed with Dani Dyer, as she said she saw a ‘future’ with Josh. Call me old-fashioned all you like, but behaviour like this is just one of the many, many reasons I cannot stand the programme. Viewers were outraged at the clip. The producers of love island need to send Georgia a warning text about Josh because I swear to god if she’s dumped from the island because she stayed loyal I’m going to cry she’s too precious. Not vibing with how disloyal the majority of the #LoveIsland boys are this year This is why so many girls have so many issues from behaviour like this – and my heart is going to BREAK when Josh chooses his new girl over Georgia when she’s been so loyal. I can’t deal with it. [sic]. Not vibing with how disloyal the majority of the #LoveIsland boys are this year ? 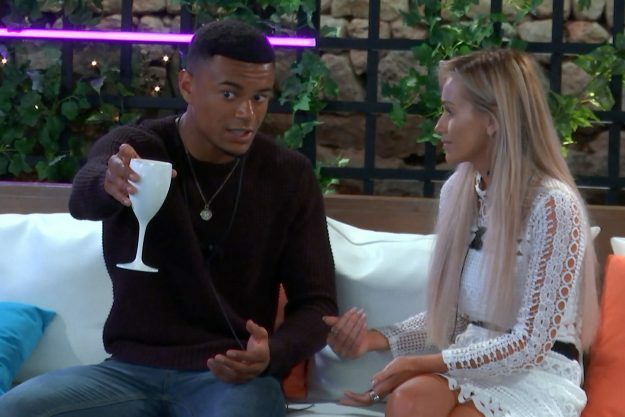 This is why so many girls have so many issues from behaviour like this – and my heart is going to BREAK when Josh chooses his new girl over Georgia when she’s been so loyal. I can’t deal with it ? Love Island is on ITV2 Sunday to Friday at 9pm.